The kidneys successfully make urine both in the lab and when transplanted into a rat. Functional rat kidneys have been made in lab by researchers at Massachusetts General Hospital, leading to hopes that bioengineered replacement organs for humans are closer than most think. The kidneys produced urine both in the lab and after being transplanted into rats. They were grown on a natural scaffold of collagen called the extracellular matrix, which helps the grown kidneys to hold the shape and internal architecture of the natural kidney. Holding the shape of the natural kidney is an advantage over an artificial organ replacement because it's immediately implantable and won't interfere with nearby organs. The extracellular matrix's blood vessels were injected with human kidney cells, and then newborn rat kidney cells were used to fill out the other parts, resulting in tissue regeneration. After incubating for five days to allow growth, the kidneys were fully functional. Currently, the extracellular matrix used is made by stripping a living organ of its cells, and a sustainable solution would require a lab-grown matrix as well. The researchers did note that the urine produced by the kidneys was lower quality than from natural organs, but that may be due to the immaturity of the kidneys. 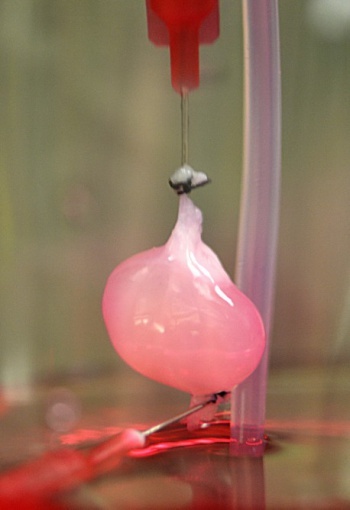 While some artificially decellularized tissues have had problems with blood clotting, the researchers saw no signs of bleeding or clotting during the experiment duration. The kidneys functioned for the whole experiment term, though the experiments were short. Thousands of people die each year for a lack of transplantable organs, or while awaiting organ donors, and bioengineered organs could ease or eliminate such shortages. Dr. Harald C. Ott, a senior author of the paper, said that when a patient needed a kidney "You'd take a kidney matrix off the shelf, then, in an ideal world, you'd take cells from that patient and create a kidney on demand." Like our science news? Check out our weekly science show, Geekend Update, for more.